The Botswana Institute for Development Policy Analysis (BIDPA) is a non-governmental research organisation established by a deed of trust. The two key areas of BIDPA’s mandate are development policy analysis and capacity building. Its aim is to promote policy analysis through research, capacity building, assisting organizations or individuals where appropriate, monitoring the country’s economic performance and disseminating policy research results. The mandate of the Botswana Ministry of Agriculture is to develop, on a sustainable and competitive basis, the agricultural sector by improving farm incomes, generating employment opportunities and raw materials for agribusinesses and conserving agricultural natural resources through the promotion and adoption of appropriate technologies and management practices. 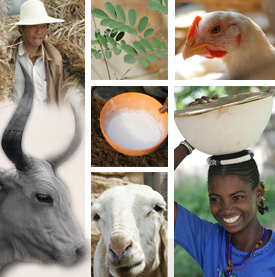 The International Livestock Research Institute (ILRI) works with partners worldwide to support the role livestock play in pathways out of poverty. ILRI research products help people in developing countries enhance their livestock-dependent livelihoods, health and environments through better livestock systems, health, productivity and marketing. ILRI is a member of the CGIAR Consortium of 15 research centres working for a food-secure future. ILRI has its headquarters in Nairobi, Kenya, a principal campus in Addis Ababa, Ethiopia, and other offices in southern and West Africa and South, Southeast and East Asia.